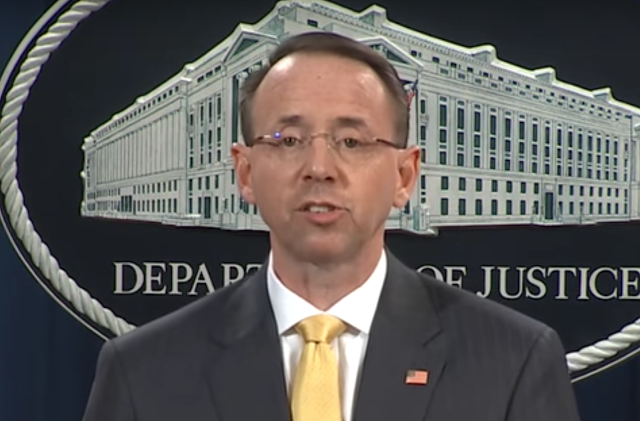 On Friday, Deputy Attorney General Rod Rosenstein gave a brief press conference wherein he announced indictments of 13 Russian nationals and three Russian organizations for interfering with the 2016 US elections. From a body language perspective, Deputy AG Rosenstein provided many teaching examples during his presser. One nonverbal signal which few people ever notice - and even less interpret correctly is discussed here. Beginning at 4:01, Deputy AG Rosenstein continues, "On September thirteenth of 2017, soon after the news media reported that the special counsel’s office was investigating evidence that Russian operatives had used social media to interfere with the 2016 election, one defendant allegedly wrote - quote [sic] We had a slight crisis here at work. The FBI busted our activity. So I got preoccupied with covering tracks Ω together with my colleagues - end-quote [sic] §"
At five different times (4:01- 4:02, 4:14 - 4:14, 4:16, 4:24 - 4:25, 4:29) during this one particular paragraph, Deputy AG Rosenstein bounces briefly up on his toes. Please watch the video several times at regular speed and at half speed to fully appreciate this dynamic. This up-on-toes body language dynamic betrays a momentary surge in his adrenaline - which is occurring secondary his emotional excitation. These signals are both subtle and evanescent - and they're very often missed in everyday interactions - yet they tell us the emotional tone Rod Rosenstein is thinking-feeling in these moments. Summary: Attorney General Rod Rosenstein was experiencing an adrenaline surge during his press conference on Friday. He was excited and has a high degree of confidence for success. In short, this signal is indicative of Rosenstein-Swagger. Yet he did not, however, reveal all his chess moves (well ... not all verbally).